Washing your windows takes you a too much time and energy? 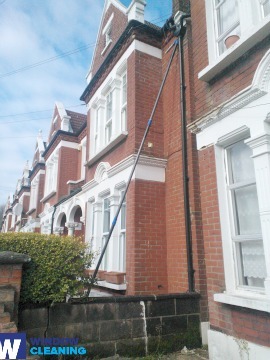 You can do something different now – simply call our representatives and request our window cleaning in Woodside Park. We will manage this nuisance for you and the final result will be appropriate for each part of your windows – the glass, frames and sills. With our support, you will have the flexibility to do anything you desire with the time you normally spend for window washing. But our services will give you even more, as you can see from our list of benefits. We also provide our professional services in nearby areas: Muswell Hill, North Finchley, Cranley Gardens, Colney Hatch, Wealdstone. You can depend on the skills and competence of the specialists for cleaning all types of windows. The glass surfaces in our proficiency are: single or double windows, bay ones and sash windows. Of course, if you have French doors, garden windows, conservatory or skylights, we will make them nicely-looking, too. With our progressive methods and latest machinery, we can tackle all types of window cleaning, even with hard-to-reach glass panes. The specialists of commercial window cleaning will provide you with first-class service for your work environment. We can reach up to the fourth floor of your office with our water-fed pole system. If you have windows higher than that, we will perform the cleaning with the help of our rope access equipment, designed specifically for hard-to-reach glass panes. In other words, you can rely on us for thorough window cleaning of all business property types - from small shops to the towering office buildings in London. We are glad to use the latest techniques to make sure that you receive the optimal window cleaning. The glass surfaces of your house are going to look spotless after we utilise water-fed extension pole cleaning system and jet washing on them. We use our vans to supply the poles with water and we can reach up to the fourth floor. In case you need washing of windows on taller buildings than that, we have rope access team on hand. Call us on 020 3746 3113 and get in touch with us – these efficient techniques will bring you results in no time. Benefit from our residential window cleaning in Woodside Park – we provide five-star services for your home on attractive prices. We use purified water to clean the windows completely. We use ground-based water-fed pole system. Talk to us now - dial 020 3746 3113 or just use our booking form. Our operators will help you book and answer your questions. You will appreciate the results of our residential services, we promise that!